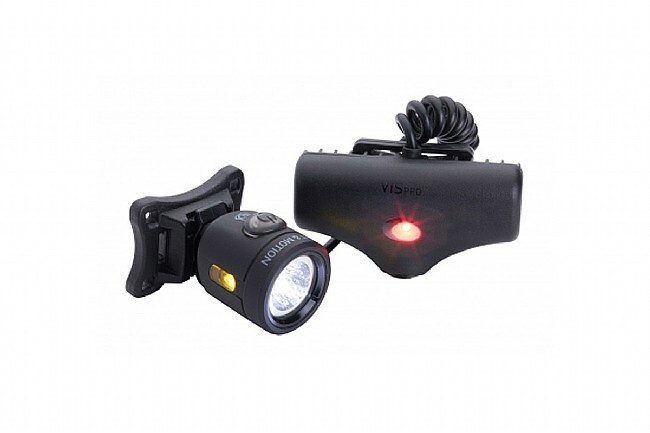 Fend off the dangers of the long, dark night with the Light and Motion Vis Pro 600 Lumen Light. Freeing up space on your handlebars for more bells, more lights, or maybe a Ward of Protection, this helmet-mounted light keeps what you're looking at illuminated, making sure you've always got your eyes on what's important. 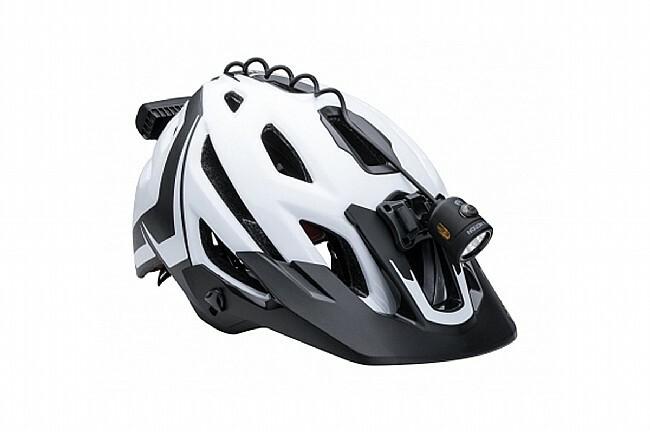 Includes Helmet Mounts and Micro USB Charging Cable. High: 600 lumens, 2 hours. Medium: 300 lumens, 4 hours. Low: 150 lumens, 8 hours. Pulse: 150 lumens, 16 hours. 600 Lumen Output Certified to the FL-1 Standard. Integrated Battery Pack With Powerful Red Rear Lighting. Innovative Amber Sidelights for Critical Visibility at Intersections. Ultra-lightweight Setup With Easy Clip On/Off Design. Waterproof to 1 meter For All-Conditions Reliability. Accurate Battery Charge & Status Indicator. I like to have a helmet mounted light, and this one does a great job lighting the trail ahead. I do wish the rear light were a bit more substantial, the older Vis 360 Pro looks like the rear light is better (and includes a reflector). Good for a solid week's commute, you do have to plan ahead with charging on account of it not supporting quick charge. For the price I paid on sale, it's a good value. I've always liked having either an all-in-one light or a light with a battery that could also mount on the helmet, and this fits the bill. The light is light weight and bright, and the red rear light is visible in the dark from various angles, which is nice. The red light will never be a substitute for a proper seat post mounted red light though, but it is a nice supplement. Well balanced on one of my helmets, not on another because cable is too short, limiting placement of light head and battery. Many mounting options as long as your helmet is vented. Nice quality overall but the cable is missing proper reinforcement at the flexstress points where it enters the light head and battery. Time will tell how it holds up. The old Vis 360 was notorious for having the cables pull out. It is SLOW to charge - 6 hours slow from 25% to 100% At this price point, fast charge should have been included. The cable is a bit short for some helmets and won't work. Part of it is coiled so L&M could have easily added another 2 inches of cable for more mounting options. Also, I don't see how this would ever work with their adventure strap without tugging or excessively straining the cable where it joins the light head and battery. The light tint has a hint of blue in it. A neutral or slightly warm tint LED would be better, especially for MTB. As previously mentioned, it is to bee seen how well the cable holds up at the light head and entry points, especially on helmets that require it fully extended for proper mounting. The following is not L&M's fault, but one of the light packages came broken, with the light partially hanging out of it. Fortunately the light was fine. A bit more padding in the shipping box could have helped as it was most likely caused due to rough package handling by the Samsonite Gorillas while in transit.